In Brunei, Shell has an ongoing programme drilling into the reservoir from below. Drilling, completing and producing an upside-down well, however, poses a number of interesting questions. 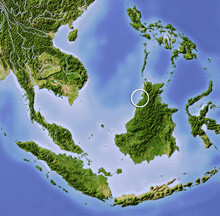 The independent Sultanate of Brunei Darussalam in North-West Borneo has been a leader in oilfield technology almost since the start of the oil business. Geology surveys were difficult to conduct in the flat coastal swamp area near Seria in the mid 1920s, so the early explorers used the relatively new-fangled method of gravity surveying. After a core-drilling campaign in the late 1920s, the Seria Field discovery well was drilled in 1929, flowing oil and gas from a depth of 288 metres (945 feet). 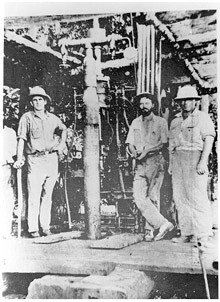 Core drilling in Seria in 1927 Photo: Brunei Shell Petroleum The Seria Field is located on an anticline that straddles the present-day coastline. 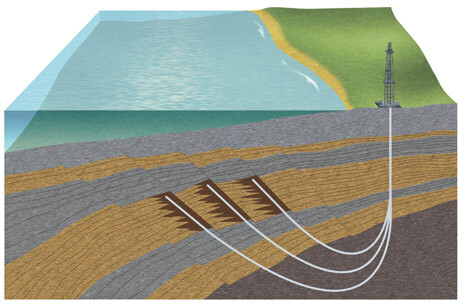 Although the most predominant trapping style in this region is controlled by load-induced deltaic tectonics, basement-controlled tectonics and uplift have played a major role in Seria. 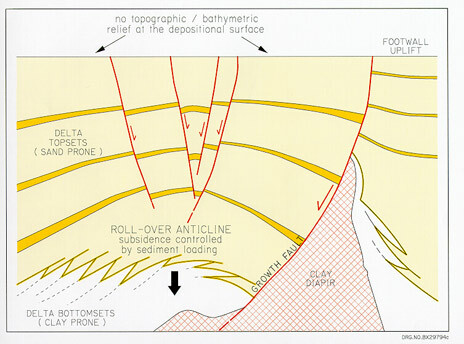 The internal structure of the anticline is very complex, with a collapsed crest and many thin reservoirs and complex faults, especially in the northern (offshore) flank. Seria, operated by Brunei Shell Petroleum Sdn. Bhd., is defined as a giant oilfield and achieved one billion barrels of production in 1991, which was marked by the distinctive one billion barrel monument, opened by His Majesty Sultan Haji Hassanal Bolkiah. Although the field is still producing, by the 1990s production was considerably less than the peak of the 1950s of over 100,000 barrels a day. But most of the production was from the onshore part, the complexity and shallow water (2 to 10m) of the Northern Flank having deterred exploration and development until then. 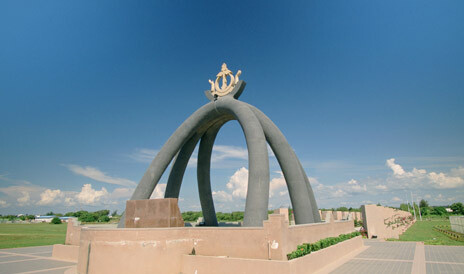 The Seria Field 2 billion barrel monument. Photo: Shell International In 1989, a 3D seismic survey had been acquired over the Seria anticline and the surrounding area, but could not fully resolve the complex shallow crestal and North Flank areas in spite of the best reprocessing available during the 1990s. 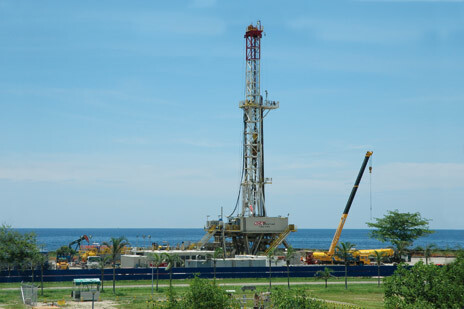 Towards the end of that decade, technology once again came into play on both the geoscience and drilling sides, to give the Seria Field a new lease of life. In 1998, a high resolution 3D survey was acquired over part of the previous 3D, to cover the central part of the Seria Field and much of the North Flank. The survey used the latest seismic technology of the late 1990s, with close shot and receiver line spacing and intervals and over 2,000 channels per shot. Close attention was paid to the continuity of multi-azimuth sampling, with, if possible, no omitted or offset shots. Whereas the 1989 survey had mixed Vibroseis with explosives and airgun sources, all shots in 1998 were impulse sources, buried charges onshore and airguns offshore. Micro-charges and special Magnaseis™ detonators were even used by a specially trained crew in the town and other sensitive areas to maintain coverage whilst observing the highest safety standards. The new data proved to be of high quality and much improved vertical and spatial resolution. With both the old and new 3D surveys processed using pre-stack depth migration, a multi-disciplinary evaluation team made new maps showing the as yet unexplored prospects in the near-offshore areas. To further accelerate the programme, the prospects were split into clusters so exploration could continue while development was taking place at the first discoveries. This technique, which involves drilling the formations ‘uphill’, from top to bottom, was given the name ‘fish-hook’ drilling, after the shape of the well profile. “Drilling, completing and producing an upside-down well poses a number of interesting questions. Like, ‘how do we get the drill to actually go uphill? Can we install a gravel pack over the reservoir and what would happen if we needed to do a cement abandonment of an uphill section? And given that pressure normally increases with depth, how do you get the oil to flow downhill?’ In short, there were no guidelines for drilling, completing and producing uphill wells, so almost everything was a step into the unknown,” John explains. The development team was able to benefit from the experience gained in another leading suite of Shell technologies developed in Brunei, Smart Fields. Rotary steerable drilling has been taken to near technical limits when drilling ‘snake wells’ in the Champion West Field, and software modifications allowed these techniques to be used in Seria when drilling more than 20 degrees above the horizontal. The drill collars, applying weight to the bit, had to be moved further back along the pipe, to keep them in the vertical section. Fish-hook wells drill upside down into the deepest reservoirs first Image: Shell International. 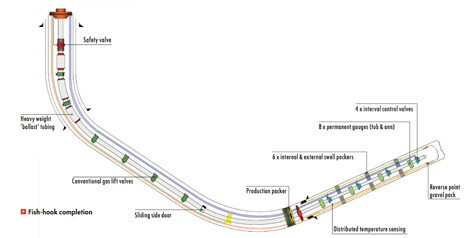 Details of fish-hook completion Image: Shell International With oilfield services company Halliburton, a solution called the reverse port technique was developed. This involved pumping gravel to the toe of the well and then, working backwards (i.e. downhill), packing it along the outside of the screens. The team then had to work out how to manage production in the upside-down hole. Because the production at the toe of the hole was from a shallower level than further back along the production string, they had to get the oil to flow down into increasing pressure. The experience from Champion West again came into play. They applied Smart Field technologies to split the production interval into four separate zones that could be controlled independently. 15 of the ‘fish-hook’ wells have been drilled so far, ranging from 1,500 to 4,000 metres in length. The techniques have been refined and optimised to give cost-reductions as experience is gained. Two of the early wells were connected to existing facilities less than a year after drilling. John Church points out that the combination of seismic and drilling technologies will allow many small fault blocks to be developed up and down the Brunei coast. The investment in these technologies has certainly been worthwhile. We should like to thank Brunei Shell Petroleum Sdn Bhd. and Shell International for kindly granting permission to publish this article. Electromagnetic surveying is one of the least well understood of the non-seismic exploration techniques. There are various acquisition choices to be made - for example it can be undertaken using both horizontal and vertical transmitters/receivers. To understand the physics it pays off to use an analogy with heat waves.